Above is the 12 x 24" oil I painted from drawings I made on location at the house that Edward Hopper worked from for his famous oil Route 6, Eastham. Hopper made his painting based on drawings he made on the side of the road. Route 6, Eastham is the keystone of the Swope Art Museum's Permanent Collection and is one of Hopper's best known paintings. The Swope invited me to show my paintings that I've made of the interior of Hopper's Truro, MA studio during my residencies there and of the surrounding area in a show they are organizing, Light and Shadow: Paintings and Drawings by Philip Koch from the Edward Hopper Studio. The show will open Feb. 3 and run through March 25, 2017 in Terre Haute, Indiana. Here below is a view of my studio today with the new in-progress 60" wide version of my smaller oil well underway. Should be fun to see this hanging when it's completed in the same galleries in the Swope Museum with Hopper's famous oil. I've learned the most about making paintings that celebrate intense sunlight from Edward Hopper (1882-1967), who had to have painted the brightest sunlight of any of the early 20 century American artists. But Hopper was picking up on a tradition of the light-loving Impressionist artists who'd gone down the path before him. 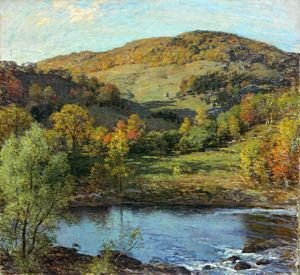 Above is a landscape from my "first museum", Rochester's Memorial Art Gallery by my favorite of the American Impressionist painters, Willard Metcalf (1858-1925). It masterpiece of contrasting the warm ochres in the undulating hillside with the surprising cool blue-green hues in the water's reflections. It perfectly evokes the light of a late afternoon just as the sun begins to speed up its descent to the horizon.